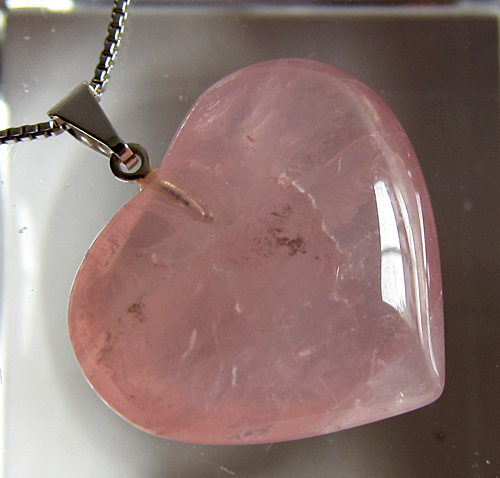 Dimensions (HxWxD): 1.35" x 1.15" x 0.25"
This bright pink rose quartz heart pendant, weighing nearly 1/3 ounce, is nearly 1 1/2 inches high, and displays a luminous quality. 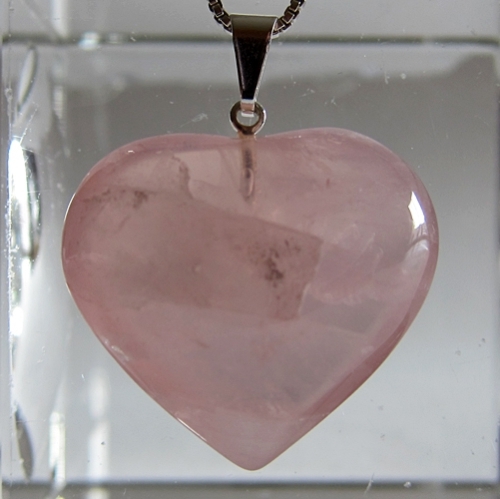 This lovely rose quartz heart comes with a sterling silver chain, ready to wear when you receive it. This is one the nicest inexpensive crystal heart pendants we've ever seen. Crystal healers also find rose quartz to be extremely beneficial in treatment of individuals who have experienced the loss of a loved one, or who find themselves picking up on the emotional wounds of others around them. Rose quartz projects a soft, soothing, gentle energy that resonates with vibrations of love, and is especially supportive in cases where an individual is developing the capacity for self love. Rose quartz sends out an energy of unconditional love, as compared with passionate love, so the energy of rose quartz resonates with the heart chakra rather than the lower chakras. This is a gently healing stone, allowing for the slow opening of the heart to healing and loving energies. It supports the wearer or bearer of this stone in all spiritual practices and daily activities that promote the development of compassion for all beings -- and especially for oneself. Rose quartz is the quintessential stone of self-love. Note: weight above is shipping weight. Actual weight average is .3 oz. Each piece is unique & may vary slightly from photo. Each piece is guaranteed to be beautiful and to meet with your complete satisfaction!